Oriental Shorthair Cat - this photo by .m for matthijs was added by Michael to show the breed. There is no connection between this cat and the article. 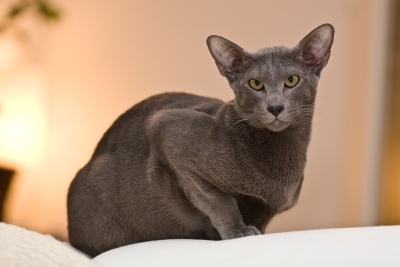 I was informed of Hepatic Amyloidosis in Siamese & Oriental Cats by a visitor (Lisa Lyons) to this website who lives with beautiful Oriental Shorthair cats. You can see her post here: Owned By Two Oriental Shorthair Cats. I had not heard of this disease despite building a page on Genetic Diseases in Purebred Cats some time ago. Lisa thought that it was pretty rare in Oriental Shorthair cats. Apparently it also affects Siamese cats, which is unsurprising as they are one and the same cat almost, the Oriental being a "modern" Siamese that has a much wider coat colour and pattern range. I am not sure how prevalent it is amongst these two breeds; and lets remember that the Siamese is a very popular cat breed. A site dedicated to this disease (link below) informs us that although we are not sure how commonplace it is, the author of the site feels that it is " fairly widespread". The point she makes is that breeders breed from the same bloodlines (same original cats). On this basis it is likely to be fairly widespread I would have thought. It is often misdiagnosed and has been in existence for about 30 years. The symptoms of Hepatic Amyloidosis in Siamese & Oriental Cats include: feeling ill, pale gums, pale ears, slight jaundice (yellow skin and eyes), high white cell count, low red cell count, vomiting frothy bloody fluid, the disease may wax and wane, come and go. Amyloid cysts damage the liver causing it to bleed. The cat dies quickly. This can produce an incorrect diagnosis but a biopsy shows blood in the abdominal cavity. The disease is incurable and fatal. Some cats die within 2-3 years. Research into genetics as this is an inherited disease. A gene marker is being searched for to understand how the disease works and how it can be cured. Cat owners who suspect that their cats have the disease should go to this website -- link broken May 2013--- and follow the instructions at the base of the page. This will help in the long term to control and eventually eliminate this nasty disease. The disease also affects Abyssinian cats and a dog breed, Chinese Shar-Peis. The disease generally leads to hepatic disease (liver disease) as mentioned above. Another condition associated with Hepatic Amyloidosis in Siamese & Oriental Cats is hypervitaminosis A. Other signs are anorexia (weight loss), polydipsia (excessive thirst), and polyuria (the passage of large volumes of urine), vomiting, icterus (jaundice as mentioned above), and hepatomegaly (an enlarged liver). I left the comment dated 23/1/2010. I am so sorry to hear of the passing of your beloved 14 year old. Although some of the symptoms are the same as my boys suffered, such as vomiting with blood, weight loss all the information I have read state cats with Amyloidosis do not live beyond 5 years. Certainly both my siamese boys passed away before 5yrs. Interestingly as you mentioned for both my boys the Vets suspected & tested for FIV results were negative. 1) The scan of (chocolate who passed away) showed a very poor liver, completely covered in "cysts" the vet had never seen anything like it - the "cysts" are thought to be pockets of protein that have attached themselves to the liver. 3) Taking the above steps would not stop or cure the disease it would give us more time to try & stabilise the disease. New drugs are coming onto the market all the time although I am not aware of any particular research to help with Amyloidosis (other than mentioned here) I would be willing to try anything - to be blunt you have nothing to loose, the prognosis for Amyloidosis is fatal. the cause or diagnosis is not confirmed and therefore Amyloidosis remains, conveniently under the Radar. This certainly suits the breeders but also the Veterinary community who therefore do not have to deal with something they know little or nothing about - it is utterly shameful in my opinion that both communities prefer to turn a blind eye to this horrific disease! So to date both my beautiful boys are perfectly healthy but I worry constantly and will continue to do so until they re both over 5 yrs. Hi..sorry to hear of your cat's ill health and passing away. You know this disease is not even mentioned in what I consider to be the best and most comprehensive book on cat health: Cat Owner's Home Veterinary Handbook. I refer to this book for information and assistance. I can't add anything therefore. Sorry about that. The Siamese cat does have a lot of potential to acquire genetically based illnesses. The Oriental SH is the same cat really. It seems to me that this problem originates in breeding. I suspect that breeders know about it but keep quiet but I could be wrong on that. Sorry to hear about Talal, sounds like he was a true fighter! Mind you, I think anyone that knows the breed would agree that they're all little fighters! 😀 As I sit here now I'm snuggled up to Londo, the full-blooded brother of Orli, whom the original article was written in memoriam. He's coming up for 6 years old now, so that's twice the lifespan his brother had. With luck, Londo has NOT inherited this awful disease! And like you, I wish there were a blood test, or something that could be used to identify this horrible monster lurking in the shadows. I pray that both Londo and Talal's sister dodge this, as I don't want to see more of this beautiful breed brought low. Our usually very healthy CFA registered purebred neutered male seal point Siamese suddenly developed insulin dependent diabetes and hepatic lipiodsis at age 9. He was given an emergency esophageal-gastric feeding tube by which to receive a slurry of Hills A-D q 2h for 4 weeks and started on insulin every 12 hours. What a champion Talal was and he survived for 2 1/2 years with adequate blood glucose control after the amyloidosis became manifest; however, despite best efforts by North FL Vet Speciality DVMs, he died at age 11 from the disease. His full-blooded sister is now 12 1/2 and has no signs of having this disorder. We need an accurate blood test to detect the disorder! I just wanted to thank you for spreading the word about this horrible disease! I lost my beloved siamese boy 4 years ago at age 3.5 years to Amyloidosis. We contacted the breeder at the time to inform her of the diagnosis and she completely denied it. We now another an Siamese a Chocolate point (from a different breeder) who is nearly 4, sadly he also has Amyloidosis, we manage to pick it up early as we recognised the signs, however he will die. In the 4 years the amount of information or research into this terrible disease has not increased. I believe here in the UK that the breeders deliberately keep it under wraps, for financial gain, it would ruin their industry! Although everyone tells me that it is a very rare condition, I do not believe them. There is no way we could be this unlucky (lightening does not strike twice). To the Siamese breeding community please please stop the breeding process and face up to this horrific disease. If you really care for these beautiful animals, you will stop their suffering. Thanks to the person who made the last comment and provided some useful contact details - appreciated. I know of a lot of genetic diseases but this one is not referred to in a book on genetic diseases in purebred cats as far as I can see. Medical, Genetic & Behavioral Aspects of Purebred Cats by Ross D Clark DVM. Could you tell us what breeders do to try and eliminate it? If, as you say, this nasty killer disease has been known "
for years" that is not a very good indicator that breeders are doing a satisfactory job. It indicates that breeders are working within the problem creating cats that are destined to suffer rather than pausing, reflecting and prioritizing resolving the problem. "Don't Take Your Organs To Heaven, Heaven Knows We Need Them Here"
Facing a terrible overnight wait until I can see my vet,terrified my beautiful 8 month old white Siamese has this.Whilst not seeming Ill,he has not eaten properly all weekend and has been lethargic,just a couple of days later he has massive weight loss ,his ears and face look yellow and he will not eat or drink at all. Seeing my vet in a couple of hours,praying it’s something else,not only for my kitten but For my 2,other Siamese boys aged 2 & 3 ,who although from a different breeder it turns out are related to my kitten. OMG I hope he is okay but the yellowness is a bad sign. If you have time and feel in the mood please come back and tell us how it worked out. Good luck to you both. Was not my usual vet,thinks FIP and tests being carried out now,my fears over Amyloidosis pretty much ignored,I’ve paid extra for blood count to be done to ease my mind,will update but you’re right,yellow is a bad sign and we are not hopeful,really appreciate the support Michael,thank you. Please tell me what happened to your baby….I just lost the love of my life 8 days ago. His symptoms were very similar. The vet thought Simon had FIP too and told me it was fatal. Devastated, I brought him home to die, wasting 3 precious days until I got a second opinion from his former surgeon who was out of town. He did not agree and recommended we start driving 5 hours to see the closest ER vet and internist. He was not eating or drinking, jaundice, lethargic, isolating….and severely anemic. He received a transfusion of DOG blood! Simon was type B blood(Siamese are almost always type A), it was unavailable in Canada and needed to be flown in from the states. Our vet knew of success in other countries using canine blood and it gave him 3 extra days, buying time until the type B arrived. He was FIV and FLV negative. He was in critical care for four days. It was horrible. He developed fluid around his lungs which was drained. He tested negative for parasites. He had hemolytic anemia, very low white blood cell count,and a heart murmur. The night before the blood arrived we visited him around 1130 pm. He looked better, less jaundice. He was more alert, he acknowledged me with his silent meow. Dragged himself to the litter to pee. I cuddled and kissed him, had a long visit. Told him to hang on, told him how much I loved him and Thank You for loving me. I left feeling so hopeful and happy. The vet called 15 minutes after I left saying Simon’s heart rate and BP had dropped he was unresponsive. I immediately returned, I am a RN and I saw he was actively dying. He would not make it Til morning. He had fought hard and suffered more than enough, I had spent eight grand trying to save him….and I had to say goodbye. This is the most painful experience of my life. I wish I knew what happened. I blame myself. I wish I knew why he died. Thanks for commenting Kerry. I think your comment is directed at another person. So sorry to hear about your cat’s passing. Lost two Flame Point Siamese to this horrible diseases. Was never diagnosed, but I am sure this was what we were dealing with.unfortunately I like this breed gor their beautiful coloring but for the personality .first I lost sammerjoe in 2001, for three years, poor ols boydied in my arms at 161/2 years old.next I got honeybear he eventualky started just like sammers vomiting and losing weight.last3d about three years until he to passed away one 3vening last year.he was 121/2.i just disvovered thid disease.now im getting honeybears sister mochi tested for this, I hope that she will be fine, as she is female, seems most people talk about losing their male cats.maybe it onky affects males.she is healthy and robust at age 14.honeybears nickname 2as hurler or hurley for good reason vomited all over the place, constantly cleaning up after him, poor fellow could never keep food down.miss my boys. It sounds like you and your cats went through a very tough time. I am sorry to hear that. Thanks for sharing though.